UNITS Moving and Portable Storage of Sacramento is locally owned and operated by local residents of over 20 years! Moving or storage requirements are stressful enough, so we do everything we can to make it easy and to exceed your expectations! We are local owners who care and we will work to exceed your expectations. At UNITS Moving and Portable Storage of Sacramento, our storage containers will help take the hassle and worry out of your next move. Containers from UNITS Mobile Storage are the efficient and affordable moving and self-storage alternative to traditional storage facilities and moving companies. UNITS Portable Storage provides clean, modern Storage Facilities… here’s how! If you are moving and your new location is not “move-in” ready, you can store your personal belongings in a 12’ or 16’ UNITS container and have that UNITS container brought back to our Warehouse for safe, secure, long or short term indoor storage! Our 22,000 square foot warehouse is equipped with state-of-the-art security including contact, motion and fire sensors. UNITS Portable Moving and Storage containers help protect your Personal Belongings! Unlike the inside of a typical moving van or truck, our UNITS containers have a channel strapping system that helps to prevent the contents in your storage UNIT from shifting. You’ll have peace of mind that your belongings will arrive safely at your new location or back at our secure storage facility. Our UNITS containers are also designed for ground level loading without ramps, which provides easier moving and decreases the risk of accidental damage to your belongings. UNITS Portable Storage saves you Time and Energy! UNITS Moving and Portable Storage will deliver your container(s) to your home or office where they will stay for as long as you need. There’s no need to load up and haul your belongings to a poorly maintained storage facility, only to unload them again and repeat the labor process twice when you want your belongings back to your new location. Once you are ready to move your belongings, just give us a call, and we will move your storage container(s) to your new location, or store them for as long as you require. UNITS Mobile Storage uses an innovative Delivery and Pick-up System called the “ROBO”! UNITS of Sacramento has invested in a new “delivery and pick-up system” that crushes the competition… the “ROBO”! While every portable storage company can deliver a container in the street in front of your home or business, UNITS unique remote controlled “ROBO” system can maneuver your UNITS container just about anywhere. Tight spaces, no problem, unusual positioning, low tree limbs or cable wires, no problem…. wherever you need your container placed, UNITS can deliver! We are local owners who have lived in California for over 20 years. We care about each customer and are committed to providing personalized customer service that exceeds your expectations. We Answer Our Phones – No Call Centers! We would not ask our customers to call us, only to re-direct them to a call center. We answer all of our phone calls personally! Our UNITS containers are the most watertight and structurally secure steel framed containers in the industry. UNITS are constructed with fiberglass-reinforced walls and four to six inch treated solid pine floors — NO plywood! Our Translucent roofs allow more organic light inside the UNIT, while our Channel Strapping system allows you to better secure and protect your belongings while inside the UNITS container. The Best Value in the Business! 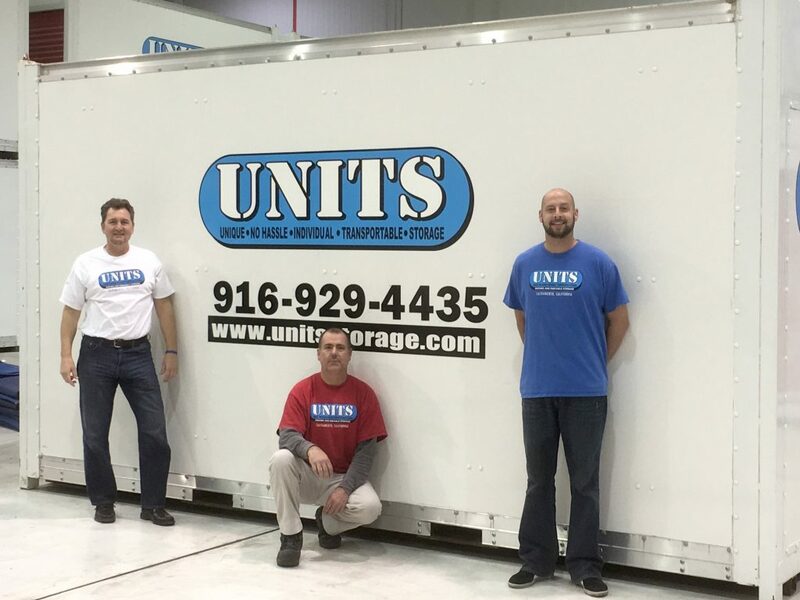 UNITS offers the largest cubic square footage of any 12 or 16’ container in the industry. We offer unbeatable customer service and to ensure competitive pricing, we price check our competition daily! UNITS Mobile Storage of Sacramento works with several local organizations, donating UNITS containers to those organizations that help others in need within our community! We have worked with the Salvation Army, Toys for Tots, Bayside Church, The Saint Rose Church Holiday food drives and additional schools and churches.